Decatur County is one of the northern most counties in Kansas, and home to the cities of Jennings, Oberlin, Dresden, Norcatur, and Clayton. Named for Commodore Stephen Decatur, of War of 1812 fame, the county was founded by J. A. Rodehauer, W. D. Stuart, W. P. Montgomery, Benjamin Lewis, and Henry P. Gundy on December 11,1879. The first churches were Methodist, one founded in Lyle and the other in Oberlin, both in 1877. 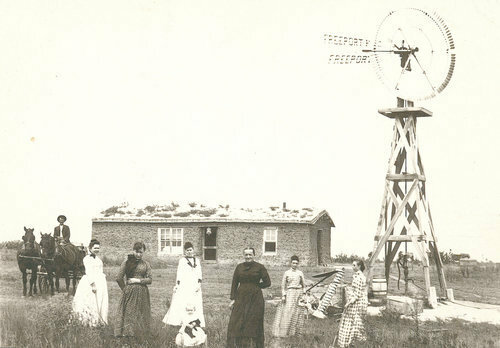 The first school district was formed in 1876 on the Van Wormer land claim. Many legends surround the Cheyenne "autumn" of 1878. This last Indian raid in Kansas occurred in the county near Oberlin on September 30, 1878. Seventeen white men were killed in the raid. A state memorial to the event was dedicated on September 30, 1911. The county was also the location of Leavenworth and Pikes Peak Express station No. 16. On February 20, 1933, people in Norton and Decatur counties felt a moderate earthquake. Buildings and houses swayed and dishes and windows rattled. The earthquake was felt across a 6,000 square mile area in Kansas and Nebraska. Sol Reese, a scout for the army at Fort Wallace, farmer, and fur trapper, was the subject of the book Border and the Buffalo, now out of print. Search our National Register database for historic sites in the county. For more information see the Decatur County website. The county museum in Oberlin contains genealogical information, homestead records, timber claims, Civil War veterans materials, and all county newspapers on microfilm. In addition, the cemetery has many of the graves from the last Indian raid.